Absolutely wonderful condo in Palm Valley Country Club! Two bedrooms plus den, two baths Palm plan. Master suite has king bed, flat screen tv and full bath, guest bedroom has two double beds and 3/4 bath. Remodeled kitchen with stainless appliances, granite counter tops, wood-look tile throughout except for the bedrooms. Cozy den off the kitchen has a pull out twin bed, flat screen tv and desk. 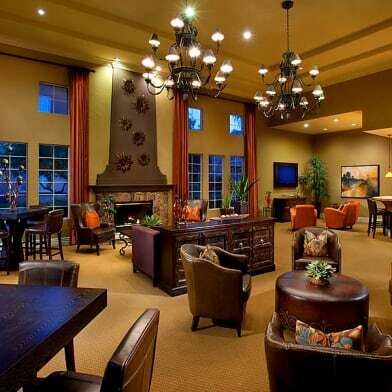 Large great room with flat screen tv and dining area. Indoor laundry. Clean and fresh and nicely decorated. Enjoy the fairway, lake and south and west mountain views while sitting on the back patio. Private interior courtyard with bbq. Pool across the street. Palm Valley CC is an exciting club with 46 pools and spas, 15 tennis courts, 4 pickleball courts, 2 Ted Robinson designed golf courses, a world class fitness and spa, golf and tennis shops, restaurants and more! Available immediately. Have a question for 38635 Dahlia Way?